Our team is passionate about trekking, the wilderness and providing you with a first class experience! Starting 18 years ago as an Outward Bound instructor, Helen has honed her leadership skills in a variety of organisations in Australia and internationally. She has led groups of adults, teens, families and staff on a vast range of wilderness programs up to 30 days in length. Helen’s wilderness guiding experience is backed by her pursuit of knowledge. She has a degree in Environmental Management, Graduate Diploma in Education, and qualifications in Outdoor Recreation, Fitness Coaching and Wilderness First Aid. Helen has designed and implemented a range of experiential education programs including adventure therapy and living skills programs for at-risk youth, to give participants the skills, strength and resilience required to lead happy and fulfilling lives. In taking over leadership of Primal Adventures in 2017, Helen is committed to continuing the tradition of running personalised small group wilderness adventures, to enable people to experience the magic and peace of the outdoors. To become more connected to family, friends and our environment. Alex is the founder of Primal Adventures, which was borne out of his love for the outdoors and his desire to enable others to lead a more natural and healthy lifestyle. Since 2006 he has taken hundreds of clients on adventures to exciting and stunning wilderness destinations that include Nepal, Ladakh, Fiji, Vanuatu, Borneo, Tanzania, New Zealand and Australia, and he prides himself on providing outstanding experiences that leave clients feeling invigorated and reconnected to the great outdoors. Formerly a corporate lawyer, Alex re-qualified as a Personal Trainer and Bushwalking & Kayak Guide and has over 14 years of experience coaching and training in fitness, trekking, nutrition and wellness. Alex also has a Master's Degree in Health and Nutrition Education and is an Exercise and Lifestyle Coach (CHEK Institute). Alex is proud to have handed Primal Adventures to Helen, to continue providing the personalised service that has made it such an enriching experience for all. Peter has spent much of his life in outdoor pursuits, last year celebrating 40 years of backcountry skiing on Australia's main range. Peter has always sought balance between parenting, seeking inspiring work and going on wonderful adventures. He has been a professional guide since 2000, teaches and assesses outdoor recreation guides for TAFE NSW, and works as a graphic designer for clients such as Breville and the Australian Red Cross Blood Service. Peter is a qualified Wilderness guide, and has an Honours degree in Industrial Design, and a Masters of Applied Ethics. Cam is one of our Trek Fitness trainers. He has managed large groups for 8 years for Evolution To Wellbeing and has his own corporate wellness company - training teams including Google and Channel 7. He is also a Level 3 Wellness coach and has completed the PTA Behavioural change in exercise course. Cameron is a strong believer in fitness being fun and making sure clients see every day as a Personal Best. Prior to joining the fitness industry Cam managed restaurants for 20 years, so got to know a thing or two about how people operate! He is particularly keen to work on functional movement as a path to enabling you to head out on exciting adventures. Amanda is a guide for Primal Adventures. She has guided expeditions for Primal Adventures in Nepal, Vanuatu, Borneo, Tanzania, New Zealand and Australia, and is a qualified Bushwalking and Kayak Guide with Remote Area First Aid training. Amanda also has over 12 years' experience in the fitness industry working as a personal trainer. 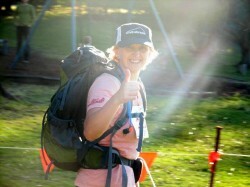 Amanda is passionate about helping people to enjoy the wilderness.